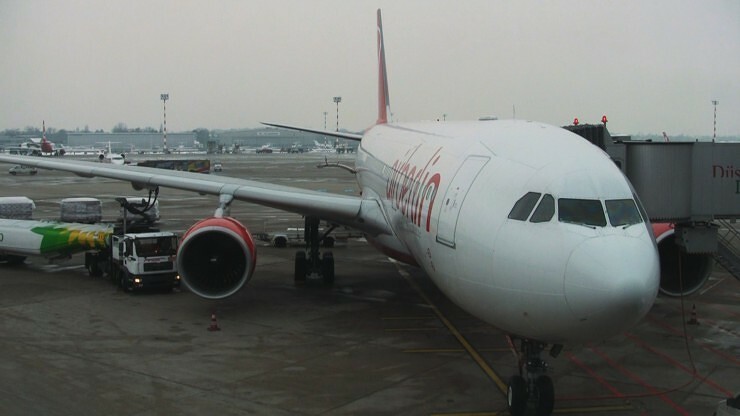 The Seat: After scoring a courtesy upgrade via a super-friendly agent at check-in to an XL exit row seat, my mood had been lifted to cautiously optimistic before my long-haul flight aboard an airberlin a330-200. I had reason to stay that way once I boarded too. Lots of legroom, full recline, adjustable headrest and the piece d’e resistance: a nice-sized personal touch-screen tv loaded with movies, tv shows, specialty programming, games. This was going to be a good flight. The seat itself proved fine. The tall-ish armrests have you feeling a little boxed-in but it’s a nice way to separate you from your potentially cootie-ridden neighbor. It’s the much anticipated personal TV that I’d been so desperate to fiddle with that let me down. As I show in the video, navigation is a breeze even without some needed categorization of shows and movies. But when it came to finally watching something, I found that my unit was missing one essential ingredient. Sound. For the next 8+ hours my sad eyes were best used watching the concert of pee-pee dances and yoga poses that inevitably happen in that space around the exit door. 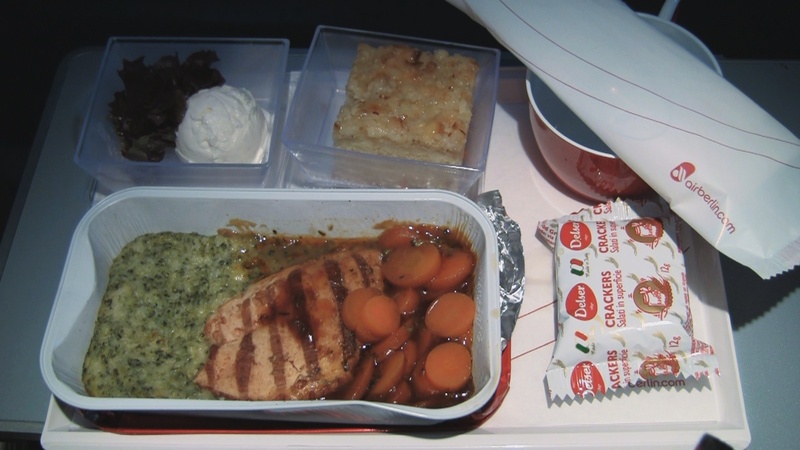 If you were trapped on a plane for 8 hours and all you had to eat was…nevermind. 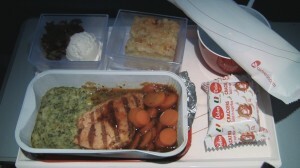 Messy chicken aboard an airberlin A330-200. Flight attendants offered solutions like “I don’t know” and “Maybe you can find another seat.” So, I looked around and found nothing but a few open spots draped in headbands and dreadlocks of sleeping hippies. Pass. From there I napped, stared, ate, then settled in to read the newspaper front to back. At least I still had a USB port to charge my phone and the moving map. But then those broke too. One by one systems shut down in 36H, I’m glad this isn’t the cockpit. All that remained was my newspaper and a reading lamp…oh crap…there goes the lamp. Service: This was your average batch of 3-star sky pals. A few flight attendants were super friendly, others seem to have rather been anywhere else. The friendliest were the ones who sold me a plastic model airplane from the duty free catalog. Everybody loves ancillary revenue. Tech/Connectivity: On a good day you should have a USB charger to fire up your fancy iSomething. You should also have a working headphone jack and reading lamp. Should. Summary: So much and so little happened here that it’s hard to summarize a normal experience in this seat aboard the international workhorse airberlin A330-200 because (I hope) this wasn’t one. If my personal tv sound, usb port, moving map and reading light had worked I’d have probably given this seat a stronger “3 hops” than the low to mediocre “3 hops” than I’m giving it. Legroom, albiet amidst a crowd of lurkers, keeps this seat in the “worth it” category if you’re someone who needs it. 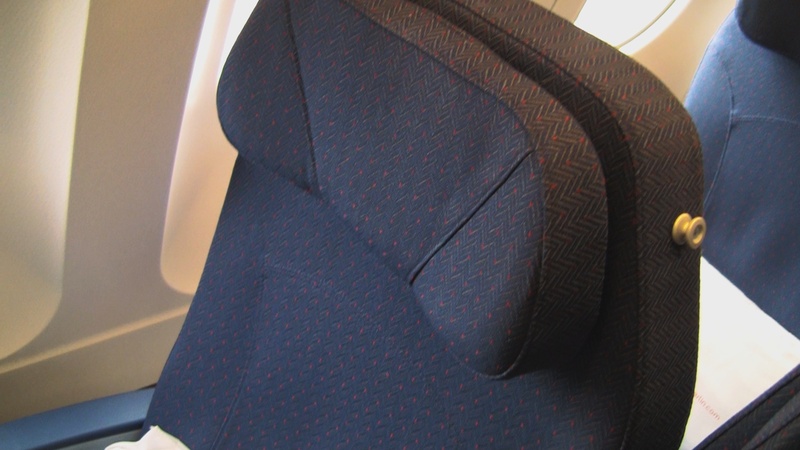 Strategy: These “XL” exit seats are available for an extra cost at time of purchase and complimentary to upper-elite members of airberlin’s “top bonus” program within 48 hours of the flight. In this case, we asked nicely at the check-in counter and with plenty of room, was given for free (Your results may vary). There is a reset button right on the face of the display unit. Unfortunate that the crew didn’t offer this quick and simple fix for you. Really? I was looking for one but the only button I saw was the one above the USB port that’s supposed to bring up an on-screen menu. Good to know! Hi there and thank you for this interesting video. I am booked on a AirBerlin A330-200 on seat 36D and was wondering if you can tell me anything about the legroom and conditions there? The seat should be equivalent to then one you had on your left. Since I am a rather tall person (2m) I require as much legroom as possible on long distance flights, so I was wondering if 36D provides that or if I should rather upgrade to 36H. Thanks and greetings! Seats in the middle section of airberlin’s normal A330-200 configuration don’t provide great legroom. If you’re tall you won’t be able to fully extend your legs. For legroom I’d stick with 36C or 36H. Great report of Air Berlin. I plan on visiting Berlin in Sept or Oct and was wondering about AB as well as the train system. Thank you! Hi could you tell me how badly is the door interferring with leg room in the 36 window seats? Thanks! The slide compartment forces the window-side passenger to angle their legs around it. If you want to stretch out at any point, it could be a major annoyance.